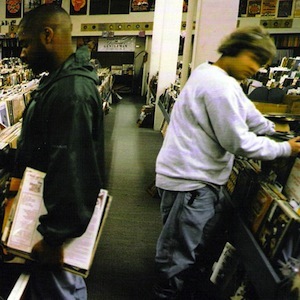 Day 280: DJ Shadow – Endtroducing…..
Endtroducing….., DJ Shadow’s legendary debut record, shows two dudes browsing a record store on its cover. While it does serve as a hint of what to expect from the actual record, it’s more of an understatement than anything. The crate digging that must have gone down in preparation for this record is simply mind-boggling. 99% of this hour-long album is composed of obscure samples, not one of which I was successful in naming. While some vocals were recorded in a studio, it’s simply amazing when you think of everything that went into this record. Haters call this type of hip-hop lazy and uninventive—if DJ Shadow didn’t create any of the samples used, he’s just taking credit for the work of others. This is also the type of person who goes to Nickelback concerts, so it’s probably best to just ignore them. It takes some serious skill to do what DJ Shadow does over and over again on this album—the man brings music of all different genres, as well as some spoken-word stuff, together to form some trippy, dreamy, beautiful soundscapes.